HomeCultureThanos - Good or Evil? Thanos is one of the most dreaded villains in the whole of the Marvel Universe. Unlike other villains in most of the movies or comics, those who kill or destroy with no reasons or intentions and do villainous activities just for the sake of being a villain, Thanos is an exception in that whatever stint done by him is justified by him. He plays the iconic ‘villain’ character in the blockbuster Marvel movie ‘Avengers : Infinity War’. The plot of the film revolves around his methodology to control overpopulation in the universe (not just Earth but in other planets as well). His idea is to kill off half the population at random for controlling the overpopulation. Thanos devises a plan for accomplishing this mission. With six powerful stones known as Infinity Stones, placed on an Infinity Gauntlet, all he need to do is to snap his fingers to cease the existence of half the population of the Universe. The world’s mightiest heroes, the ‘Avengers’, even though now split, fights against Thanos for saving the Universe. The film revolves around Thanos' quest to the infinity stones, and the fight back by the Avengers, and in the end, (SPOILER) the iconic snap which wipes out half the population in the Universe. The next part of the film, currently named Avengers 4, is set to release next year, and is a continuation to this movie. Overpopulation is one of the major issues that the world is now facing. Human popuation on earth has been increasing at a very high rate in the recent centuries. Increase in population leads to over exploitation of natural resources with rate of consumption of resources several times the rate of renewal; unemployement combined with resource scarcity, which leads to higher prices, results in a “Rich becomes richer and poor becomes poorer" scenario. Population has increased from 1 billion humans in 1800 to about 7.6 billion in 2018. Overpopulation is therfore definitely a threat to the existance of the human race and are already leading to war and strife for control of the scarce resources. The planet to which Thanos belonged,Titan, also faced the same threat and the end result was complete destruction of the planet.Thanos had proposed his idea to counter this, but every inhabitant ignored his ‘mad’ idea, but soon had to face the wrath of destiny. Thanos is said to be one of the most intelligent characters in the Marvel universe; if Titans had accepted his idea at least half of the population would have lived instead of the whole race going extinct. This story also justifies Thanos’s point. He had faced a similar situation and couldn’t act then and lost everything, but he does not want such a fate happen to any other planet. His ideaology therfore is to choose between lesser of the two evils: either the whole race of a planet goes extinct or half of them lives. The second point to justify Thanos' actions is that he wasn’t selfish at any point in the film. If so,he could have ruled the planets he executes his idea on. The film begins with him killing half the population of Asgard in the spaceship. He leaves them after executing his idea and had no plans to rule the Asgardians. Obtaining space stone from Loki, he travels to Earth. He also killed half the population in Gamora’s home planet but never did he had any intention to rule them. Gamora’s home planet, as said in the film, now after the execution of Thanos' plan has prospered and turned to a paradise. Gamora: I was a child when you took me.Thanos: I saved you. Thanos: Going to bed hungry, scrounging for scraps? Your planet was on the brink of collapse. I was the one who stopped that. You know what's happened since then? The children born have known nothing but full bellies and clear skies. It's a paradise. Gamora: Because you murdered half the planet! Gamora : You don’t know that. Thanos : I’m the only one who knows that ….at least the only one with the will to act upon it. In the last dialogue above, Thanos' guilt for not acting to save his planet from destruction is very clearly felt. 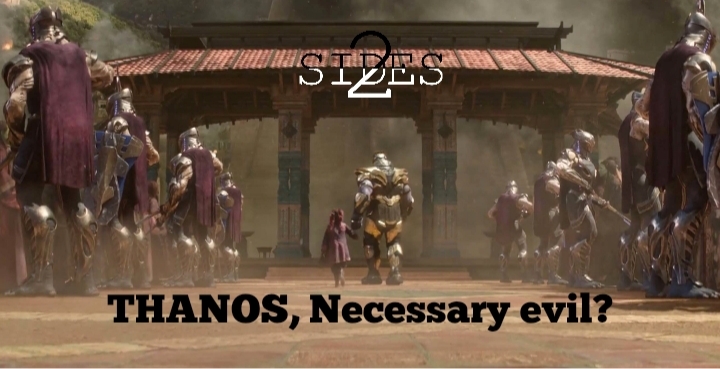 Another point is the only thing Thanos was interested was in executing his idea and all other things came next. Thor was someone who has the potential to beat Thanos and Thanos would also be aware of it. He could have killed Thor in the beginning itself on the Asgardian space ship ,but he didn’t do so because his only objective was execution of his idea. Thanos left Thor to die in the spaceship after using power stone, but could have killed him directly. He obtained the infinity stones one by one and went for the next one without any delay (he didn’t fight Star lord wither, who had attacked him after Thanos got the Time Stone). Further, he sacrificed his adoped daughter Gamora for fulfilment of his mission. He spared Tony Stark’s life in return for getting Time stone, who he knows has the potential to stall his plans. Thanos has the will and power to save the destruction of the world from overpopulation and he is doing it because he failed to act once (in his home planet) and don’t want that to happen again. His methods may not resonate with all, but it is a necessary evil. First and foremost thing to look at is that human beings are social beings who values relationships, love and affection. Killing one among us is definitely painful to everyone. Also an individual depends on lots of other individuals for his/her survival. Killing one affects many others in a very adverse manner. A very simple example for that from the movie itself: In the post credits scene of the film,a helicopter is seen crashing into a building. May be after the snap,the pilot of the helicopter might have ‘ceased to exist’. But in that process,the passengers of the helipcopter might also have lost their lives. As in the post credit scenes of the Marvel movie ‘ The Ant man and the Wasp’, Ant Man or Scott Lang got stuck in the quantum realm (entered the realm for collecting quantum particles) because the people who were supposed to bring him back from quantum state were victims of Thanos’s snap. Another thing is instead of killing half of the population, there could have been better ideas for controlling overpopulation. After all, Thanos is said to be one of the most intelligent characters in Marvel. Even though methods like ‘one child policy’ reduces productivity(working population decreases as in China),two child policy is a good idea. Every individual has the right to live. So killing them cannot be justified in any way. Also, culling of half the population does not yield a permanent solution to control overpopulation. The population will again increase as before .So sacrifice of half the population for the survival of the other half of the population is never a permanent solution. The current population in earth is about 7.6 billion. Killing half of the population would make it around 3.8 billion which is nearly about the population in 1970s. So killing half population can only shift the world to a scenario 50 years back and so it is just a temporary fix. One also needs to understand another major point - resources in the world aren't limited to only mean land, water or energy sources; individuals are also resources. So killing half the population for saving resources reduces the individual(human) resources itself to half. The scarcity of resources in the world currently is due to unequal distribution of resources. As from reports,world’s richest 1% owns half of the overall world’s wealth. Also if we look at the impact of individuals on climate change, reports say that an average person in Bangladesh emits 0.5 tonnes of Carbon dioxide per year whereas an average US citizen emits 16.5 tonnes. These statistics shows that at least some of the consequences of overpopulation are avoidable and focus should be given on equal distribution of resources which gives everyone a fair share of resources. With the advancement in technology, the scarcity of resources is something which can be dealt with - more water from better desalination techniques, using renewable sources for energy, more efficient agriculture (the current output in agriculture is at par with demand as per reports), better recycling etc. Thanos' method is a cruel and unacceptable solution, a distorted vision of the 'Mad' Titan, one who, despite his claims to the otherwise, clearly is evil. Sandeep Vivek is a student currently pursuing Electrical and Electronics Engineering at College of Engineering Trivandrum.A die hard fan of Marvel movies and stand up comedies, loves to explore and experiment. You can reach him at sandeepvivek14@gmail.com.